Yesterday, Team Blizzard Watch was chatting about the new teaser image for the next Hearthstone expansion. We all peered at it, trying to figure out just what this image, posted without any explanation, might mean. 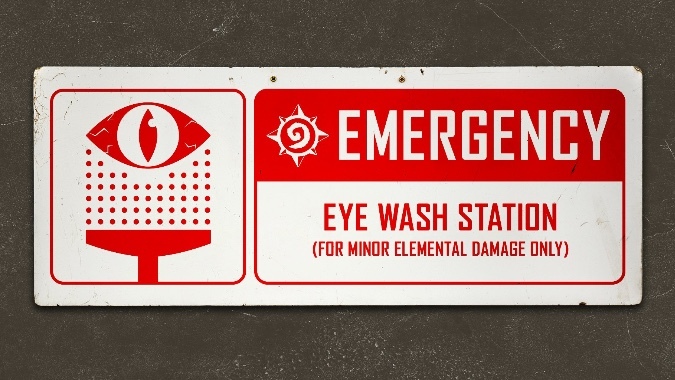 Alex: That just makes me think of our eye wash station at work. Obviously we’re getting a Warcraft Warehouse expansion. Anna: An OSHA xpack focused on profiteering goblins would be pretty dope. You may also want to ignore the fact that the sign resets to zero several times throughout the video. But serious safety concerns aside, the Hearthstone team has brought us another creation of beautiful madness. 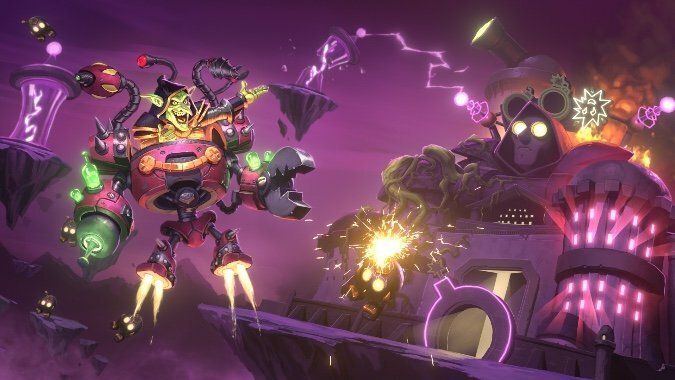 The new expansion is due out sometime in August, and of course you can already throw your money at the Hearthstone team by pre-ordering it — which will set you back $50 for 50 packs or $80 for 80 packs plus a Mecha-Jaraxxus Warlock hero. Both bundles also give you a brand-new card back, and a random golden legendary. But even though Mecha-Jaraxxus is, frankly, awesome, these card bundles don’t impress compared to the Witchwood’s 70 packs for $50 pre-order deal. I suppose that price was simply too good to last. Magnetic cards, featuring the new “Magnetic” keyword that’s just for Mech minions. You can play a Magnetic minion on its own, or play it to buff another Mech. Played by itself, it’s an ordinary Mech. Played as a buff, it adds its stats and attributes to the Mech it attaches itself to. Science! This is going to give new life to Mech decks, which haven’t been meta contenders for a while now. Project cards, which are … well, basically just cards that provide some benefit to both players. We’ve only seen one so far: Biology Project, which gives both players two mana crystals. This will be an interesting question of balance — will those two mana crystals help you more than they help your opponent? I’m looking forward to seeing the rest of these project cards, and the decks that could be built around them. Omega cards give early-game cards late-game life. The example we’ve seen is the Omega Defender, a 4-mana 2/6 Mech with Taunt. However, if you play it when you have 10 mana crystals it gains +10 attack, becoming a serious, game-ending threat. Legendary spells! They’re spells, but more legendary. Obviously. We only saw one example of this: Myra’s Unstable Element, a 5-mana spell that draws every card in your deck. Sure, that will help you if you’re having the worst card draw luck ever and need to get to the bottom for your deck, but also … it draws every card in your deck, leaving you without a deck — and probably destroying a lot of cards in the process. I can see this being interesting in Warrior decks with Dead Man’s Hand, but I’m not sure if interesting is the same as good. And hooray, there’s a new single-player mode, the Puzzle Lab. Here, you (humble lab assistant and/or test subject) will go through a series of experiments, with challenges like killing your opponent in a single turn, creating a perfectly mirrored board, or simply surviving. 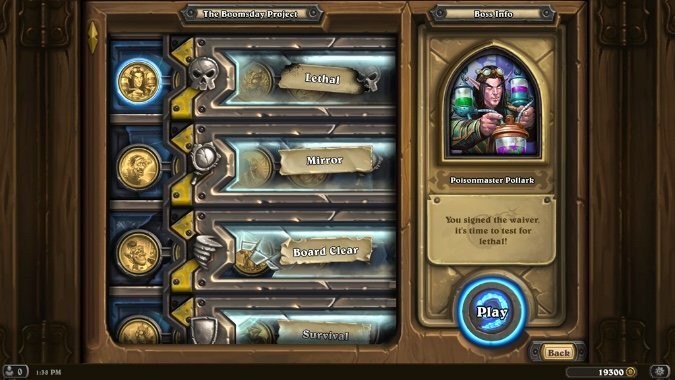 There aren’t many details on the Puzzle Lab yet, but these single-player challenges have become one of my favorite things about Hearthstone, so I’m definitely looking forward to this one. Of course, it could hardly be a Boomsday Project without Dr. Boom himself making an appearance. 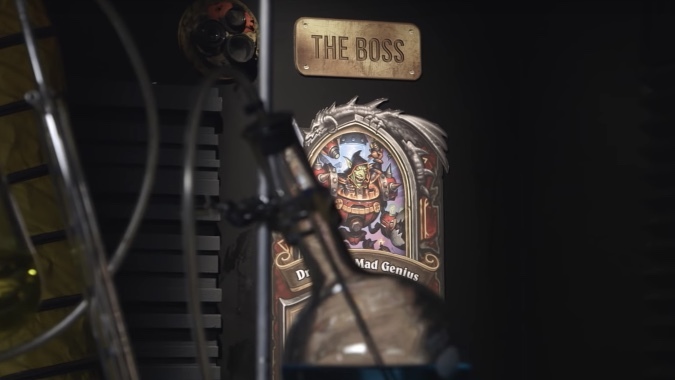 We don’t know exactly what form he’ll take, but we did see this teaser of (presumably) Dr. Boom as a Warrior hero card. In The Witchwood we only had a single hero card (Hagatha for Shaman), so there’s no telling if this new Warrior hero is all we’ll have for this expansion. Either way, hero cards have the ability to really shake up a class, and the Warrior class could use some shaking up. And as a parting note, I have to say that I’m not sure if Dave Kosak can be trusted with big red buttons — or possibly any other buttons. Is someone keeping an eye on him and making sure he has his safety equipment on at all times? I hope so.